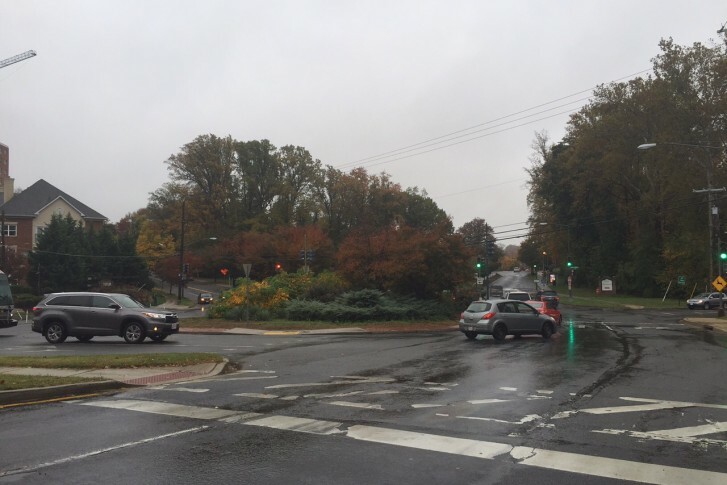 WASHINGTON — It’s a dangerous traffic circle causing accidents on the Maryland-D. C. border, but years later there are still no long-term solutions to fix the hazards at the 16th Street traffic circle. Part of the problem is the location of the circle. Since some of the circle is in Silver Spring and some in Washington, the solution requires the two jurisdictions to come together. In this case, it requires the D.C. Department of Transportation (DDOT) to work with the Maryland State Highway Administration (SHA), because it is considered a state road, not a local one, in Maryland. D.C. Mayor Muriel Bowser held numerous public meetings about the problem with her Montgomery County counterparts when she was the Ward 4 Councilwoman, but not much was done during her tenure on the City Council or so far during her tenure as mayor. SHA officials insist that they are committed to a long-term solution to the problem. “SHA has invested approximately $100,000 in engineering studies concerning the 16th Street traffic circle. We have gone as far as we can go with our independent efforts. When DDOT is at a point to move the project forward, we will be ready and willing to partner on the next steps,” says SHA spokesman Charlie Gischlar. DDOT appears ready to act on the problem, too. “DDOT has recently developed a set of short-term measures, which include signs and marking improvements, pedestrian signal head adjustments, signal timing modifications and trimming of trees to improve sight distance. These measures will be completed in November 2015,” says DDOT spokesman Terry Owens. He adds that DDOT and the D.C. police are discussing whether to add speed or red-light cameras in and around the circle. Placement would be key to any plan to do so, especially for speed cameras. A D.C. speed camera on land that belongs to Maryland could raise legal issues around the tickets. When WTOP reported on a D.C. speed camera placed feet over the border into Prince George’s County, multiple lawyers from both D.C. and Maryland suggested legal problems surrounding jurisdiction. D.C. police eventually moved the speed camera back onto D.C. property. “DDOT and SHA will coordinate to advance the selection of a preferred alternative in close coordination with the community. Once the preferred alternative is selected, DDOT will work with SHA to develop a plan for design and implementation,” says Owens. But when DDOT will begin coordinating with SHA, when it will coordinate with the community and when it’ll work to develop a plan for design and implement, are all unclear.